Earl Nightingale, renowned as the dean of motivation, once said, “We become what we think about”. Your inward grace is your outward grace & reversely also true. What kind of story do you live? Heroic or cowardly? Do you have a sense of destiny or futility? What do you think is your destiny? The destiny of this Earth? Your fate? Do you look at life as a challenge? The story you tell yourself — the myth within which you live your life — strongly affects your feelings and the ultimate outcome of your life. It can change and it can change you! You live by a story. Have you ever thought of it that way? Each of us has a story, and we are the main character in that story. Your life could probably be pieced together into a coherent story with which you live by even if you’ve never really thought about it yourself. Man of La Mancha, a musical made in 1972, is based on the story Don Quixote by Miguel de Cervantes. Its an entertaining story, but it’s also profound. You’ll find two two different persons in the same story having contrasting life outlook. 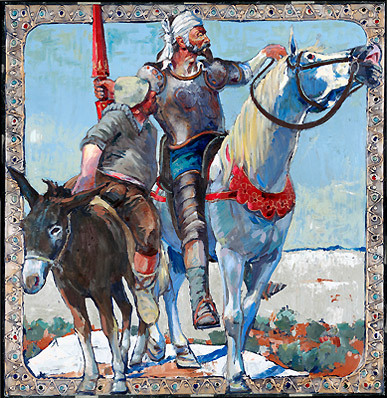 Don Quixote sees the world as a quest, as an adventure, and he sees a poor kitchen maid as a lady of unsurpassed beauty and chastity. He dreams the impossible dream, he fights the unbeatable foe, he looks at life as a challenge to do good in the face of evil and make the world a better place. He wants to dedicate his victories to the kitchen maid, his Lady. She is bitter about life, full of anger. “Why do you do these things?” she asks him. Hey! I know this is kind of off topic but I was wondering which blog platform are you using for this site? I’m getting tired of WordPress because I’ve had problems with hackers and I’m looking at options for another platform. It would be awesome if you could point me in the direction of a good platform.